Morrison Shawnee with Arapahoe limbs 53#, Beeman MFX 400 shafts, 285gr up front- 160 STOS + 125gr steel adaptor. 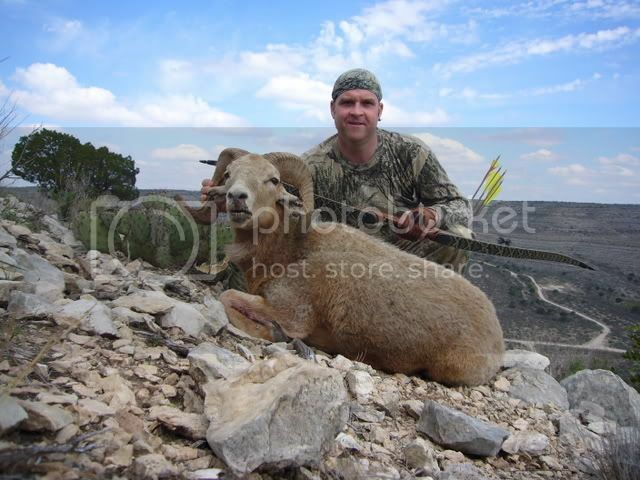 Shot on Texas Sweat Hunt #1 2007. That is an awesome ram. Congrats, and great stories on the sweat thread. Great animal and a great picture. Yep.....and congrats yet again Dave!!!!!! Beauty of a Sheep. Do not believe I have seen a Corsican that color before. Say, how for from Pandale is the ranch? I sure remember that country from my teen years. Ranch was on the Pecos river, an hour and a half or so from Del Rio. Thanks guys! That little pocket tripod paid for itself on this one. First time I have bothered with that little tripod and it worked wonders. Nice ram... and nice picture. Like Guru said, that is a great picture. Congradulations on a outstanding feat!